This leaf beetle has created an interesting little scene. There’s the leaf damage caused by feeding. The spots appear to be changing color as they age. I assume the green one to the top right of the beetle is the freshest. The light colored ones near the top must be the oldest. There’s also some frass spread around. Looking at this, I wonder if the feeding behavior isn’t offering some measure of camouflage. 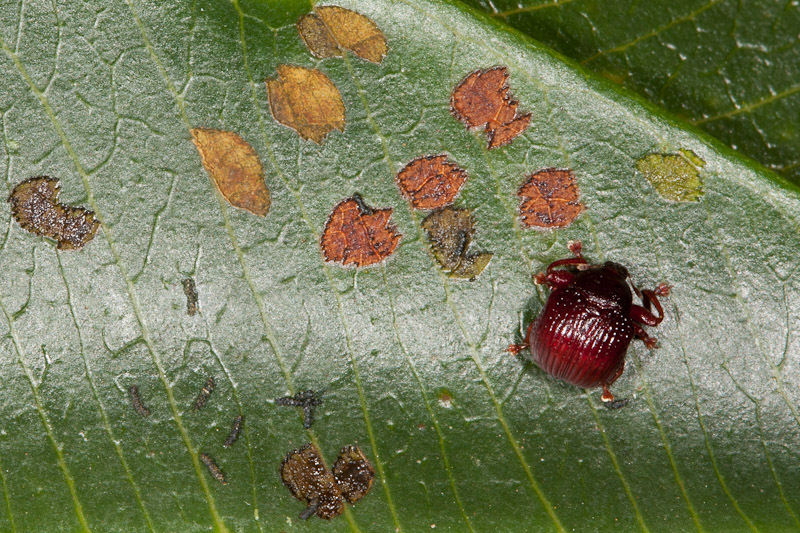 From a distance, the beetle appears to be just another damaged spot on the leaf. I realize this isn’t a great photo. No matter what I tried, I just couldn’t avoid the sheen on the leaf.